The wild iris that grow along the Pacific Coast (California, Oregon and Washington) are broadly known as ‘Pacific Coast Iris’ or ‘Californian Iris. With some of the most colourful flowers of any Iris the flowers of the hybrids are simply stunning. They will flower from spring through to summer, and with evergreen foliage, make a great addition to any garden. Although they are evergreen, in very hot, dry or cold conditions they can decide to go into dormancy. The flowers are characterised by large petals, they are ruffled and the standards are upright. The colour combinations are what make these such a desirable garden plant. Six petals are found on these Iris, 3 are upright or ‘standards’ the other three open outwards and show the best colour. 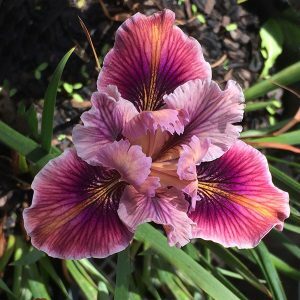 The Pacific Coast Iris group is made up of about 11 different species including: Iris douglasiana which is a major contributor to the hybrids we see offered for sale. 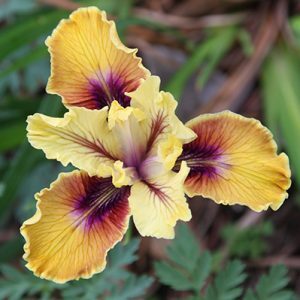 Many other species are included in the group are : Iris bracteata (Siskiyyou Iris), Iris chrysophylla, Iris fernaldii, Iris hartwegii, Iris innominata, Iris macrosiphon, Iris munzii, Iris purdyi, Iris tenuissima (Shasta Iris) and Iris tenax. From these we have lots of modern hybrids. Pacific Coast Iris prefer a shaded to part shaded position especially in warmer climates. They do like a slightly acidic soil so can be planted near Azaleas, Camellias and other plants that like acidic soils. Although many are low growing, not all have the same growth habit. Height will vary depending on the actual hybrid, most reaching between 20 cm (8 inches) and 50cm (20 inches) in height. A few will reach nearly 1m (36 inches). Best planted in a well drained soil. Dappled afternoon shade is preferred. In summer a little extra water in the morning will be beneficial. A little phosphate based fertiliser once a year is adequate fertiliser. Old foliage can be removed in late autumn to tidy up the plants. 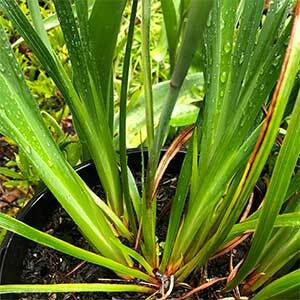 Pacific coast species are available however it is generally the the hybrids, ‘Iris Pacifica Hybrids’ and developed strains such as Iris douglasiana ‘Canyon Snow’ and ‘Mendocino Banner’ that are the most popular as garden plants. 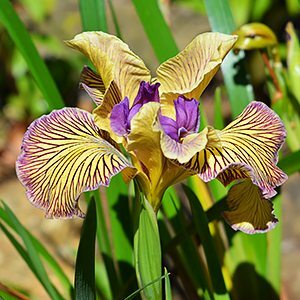 You can grow Pacific Coast iris from seed. A cold stratification by soaking the seeds cool water for 3 weeks seems to improve germination rates. Seeds are best sown in an open potting mix at around 1/2cm deep (1/4 inch). You can also divide established clumps, however they do resent being divided and may not flower the next season. The best time to divide them will depend on the climate zone, in temperate areas this is usually in early winter. It is best to take 1/3 of the clump and divide that, leaving the other 2/3rds until the next year. This ensures that you do not loose the clump. Remember they like an acidic soil, so avoid lime.